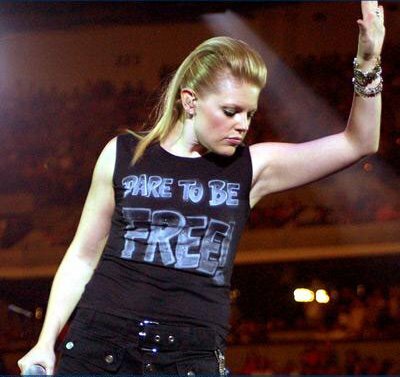 The gorgeous lady is Natalie Maines, lead singer of the Dixie Chicks. 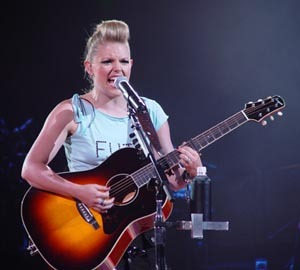 Former country music darling turned country music pariah. 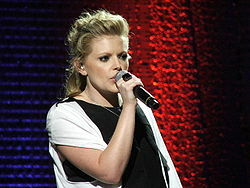 Her pipes will blow you away. As will her external feistiness. music blow hard, Toby Keith. Like I said, she's feisty. but I was shocked (and oddly impressed) at how one statement changed her life. When the Chicks returned after "the incident", Natalie wouldn't sing that she was sorry. Only that "it turned my whole world around, and I kinda liked it"
Natalie could rock "the Sinead", focus on her sons and social justice. And still sing your pants off when she opens her mouth.